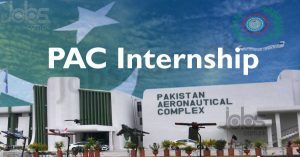 PAC Internship 2019: Pakistan Aeronautical Complex (PAC) has announced its Internship / Training Program for the year 2019. Pakistan Aeronautical Complex being hub of Aviation Industry in Pakistan, offers internship to students of HEC recognized universities. Internship is conducted in batches during summer and winter vacations every year. Applications/forms for internship are to be sent to Technical Wing by 31, March for Summer Internship Program and 30 September for Winter Internship Program every year. Duration of each batch is 2~3 weeks. Eligible candidates must submit applications on or before 31st March 2019 (Summer) and 30th September 2019 (Winter). Internship forms are available at PAC Website and can be downloaded online (link given below). Complete filled forms duly countersigned by Head of the Department are to be sent at following address in 04 copies along with recent photographs.